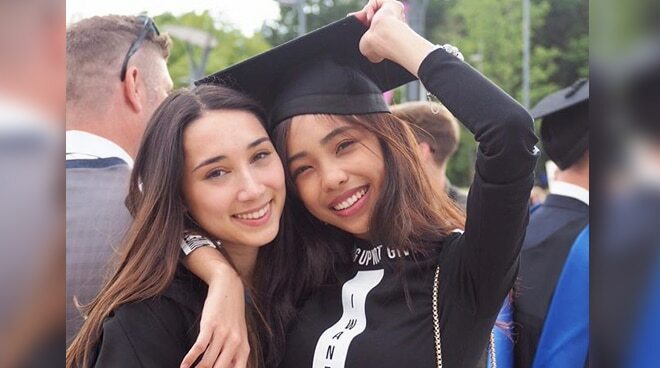 Maymay Entrata thanks Edward Barber's sister for believing that she could also finish her studies one day. Just like Edward Barber, Maymay Entrata couldn't be any prouder of her Dodong's Ate Laura—whom she already considers family—after recently graduating with a Bachelor's degree in Chemistry from the University of Warwick in England. Taking to Instagram to congratulate Laura, Maymay wrote: “Sino ba talaga nag graduate sating dalawa? Pero thank you beb hinayaan mong suotin ko ang graduation cap mo. Dahil naniniwala ka din na balang araw magiging totoo nadin yan. Love you! At Congrats! Sobrang hanga ako sa talino mo grabee! Ipagpatuloy mo lang yan at ang suporta ko'y andito lang para sayo." Born to a British-German father and a Filipina mother, Laura remained in the United Kingdom to pursue her studies while Edward has been residing in the Philippines since joining the reality competition Pinoy Big Brother Lucky Season 7.